Under UPA, when crude oil prices averaged $132 per barrel in July 2008 (it was during that month Brent reached a historic high of $147/b) petrol price was just Rs. 50.62 per litre. Today when oil price is around $80/b, petrol price has reached a high of Rs. 76.57 per litre in Delhi. On the surface it looks like Prime Minister Narendra Modi has been citizen unfriendly. No. 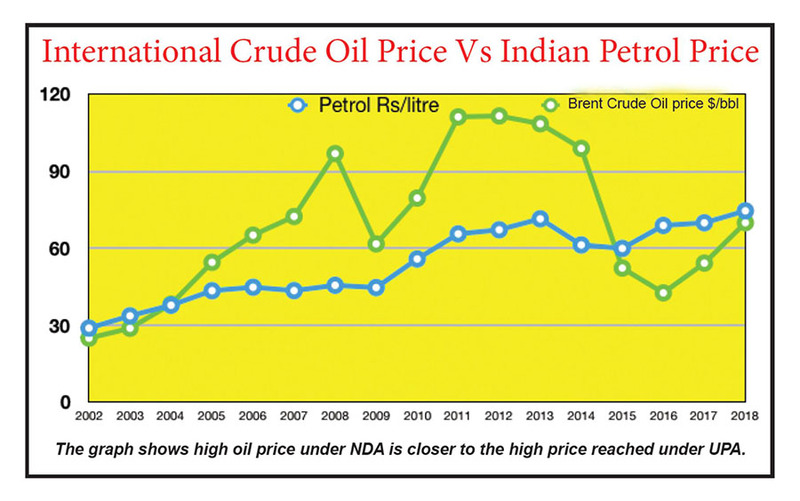 Natural for anyone to think that when international prices have fallen (by $52/b, 2008 versus 2018), petrol prices in India should also fall. But it has not. 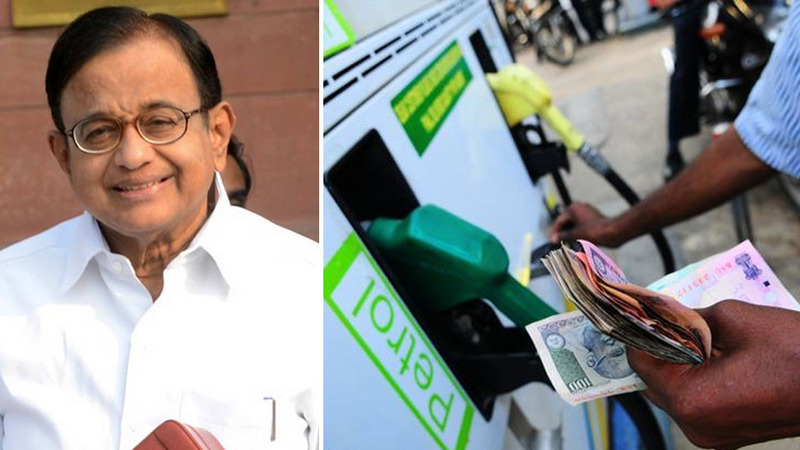 It is this simplistic, non-expert thinking which must have impelled or provoked the former Finance Minister P. Chidambaram to tweet that Modi can easily cut petrol price by Rs. 25. However, when we analyse the factors behind the petrol price movement, one will wonder how a responsible leader can mislead the country. It is shocking. NDA was lucky that soon after it came to power oil prices fell. It wisely decided not to pass on all the benefits to consumers. It increased excise taxes on petrol in small doses from Rs. 9.48 per litre to current rate of Rs. 19.48 per litre and for diesel it was from Rs. 3.56 per litre to 15.33 per litre. Chidambaram must be aware that under his government policy the public sector oil companies (Indian Oil, Bharat Petroleum and Hindustan Petroleum) were bleeding. He must also be knowing that their irrational pricing policies forced private sector oil companies like Reliance, Essar and Shell to close down their thousands of stations. Their stations were far more efficient than the ones operated by the public sector giants. In addition, the so-called “under recoveries” (in simple term losses) by the public sector companies were reaching stratosphere. In 2012-13 under recoveries of public sector oil companies was mind-boggling Rs. 1.6 trillion. Here is one more reason to convince critics of Modi that NDA’s policy was far more progressive than the populist policy of UPA. While NDA succeeded in collecting additional revenues of Rs. 4.4 trillions during its four- year rule, UPA incurred a loss of Rs. 4.3 trillions by selling petrol and diesel below cost between 2005-06 and 2014-15. Who are the real beneficiaries of different policies of NDA and UPA? I am sure the former Finance Minister must be fully aware of these facts. As suggested by Chidambaram, NDA can reduce excise taxes by Rs. 10 and revert to the level of UPA. But as a consequence what will happen to fiscal deficit? Where will Modi find the additional Rs. 15 to cut? Is he expecting Modi to force oil companies to lose (as happened when he was the Finance Minister) or ask States to reduce their VAT or act as a magician? Note: Dr. Bhamy V. Shenoy, an IITM graduate, has over 50 years of experience in international oil industry having worked for Conoco in US, and Europe. He was on the board of Georgian National Oil company, Advisor to former Soviet Union countries of Kazakhstan, Uzbekistan, Turkmenistan and Georgia and also advised Ghanian Government, Pemex in Mexico, Pertamina in Indonesia, etc. In India, he served as a member of Advisory Committee to Chairman of ONGC. READ ALSO One year of Demonetisation: Black Day or beginning of an epic war against Corruption? He was senior advisor to Centre for Energy Economics at University of Texas. 4 years ago….tax collections were far lower than what they are today. Significant number of new tax payers added. 4 years ago…..no benami laws…no laws on NPA resolution. Now both in place. Acche Din….in many ways. *Sickulars still stick to arguing about petrol prices*😂😂. Truly petrol prices have only remained lower or reached 2014 levels 😃 wondering what the noise is all about. You must understand that Modi did not bring Acche din from the sky! He snatched the Acche din which was enjoyed by the corrupt crooks and congress politicians and their friends and family circle and distributed to common man! So, all the people who lodt their Acche din have a right to criticize! The author should realise one hidden message behind the govts inability to bring down fuel prices. It is the fact of a non performing economy that is behind the reluctance of the government to reduce the prices. Otherwise here was no need for all this camaflogging the decision not to reduce the fuel prices.